Champ is this weeks Real House Pet of Jasper County sponsored by Interstate Insurance Services, Ltd. 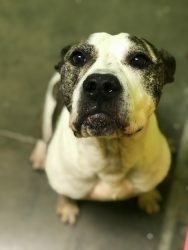 Champ is a very handsome, 5-year old pit bull mix ???? This boy is very loving and very ready for his forever home! Please meet him today! The Jasper County Animal Rescue League and Humane Society has waived adoption fees for cats for the month of October. There is not a single cage open at the shelter. They need your help! Add so much love and joy to your home by adopting! Support your local shelter. Please ask about the matching grant! You have the opportunity to make a difference!